Jill volunteers at community gardens and learns about gardening through the MD Master Gardening and Master Naturalist programs. 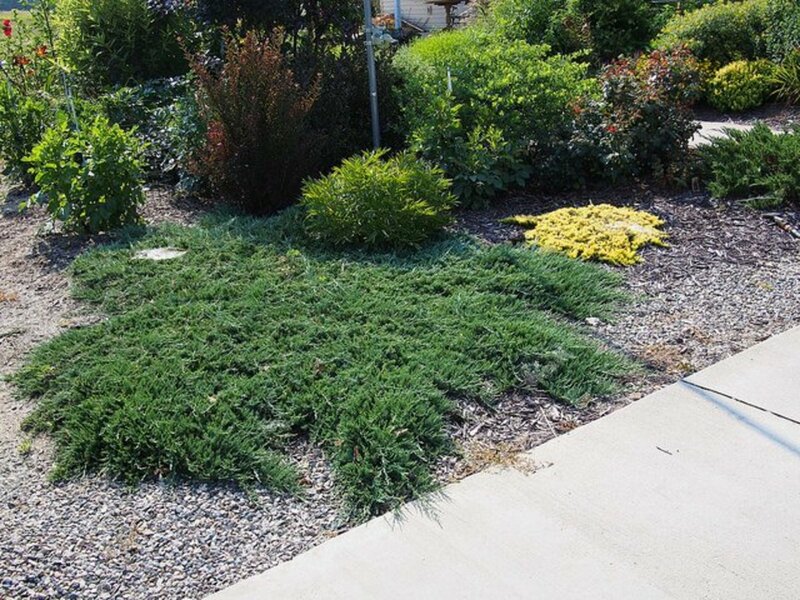 Hardy ground covers can not only improve the appearance of your yard, but they can also significantly reduce the amount of time you spend weeding. Need coverage for a dry area that gets full sun? Struggling to grow grass in dry shade? 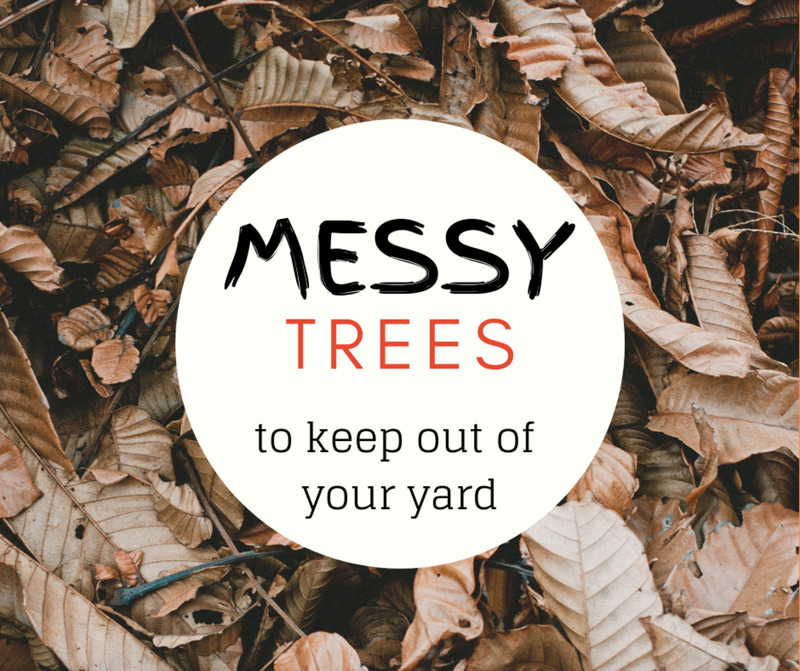 Or perhaps your landscape suffers from boggy patches marred by bald spots and scraggly weeds. 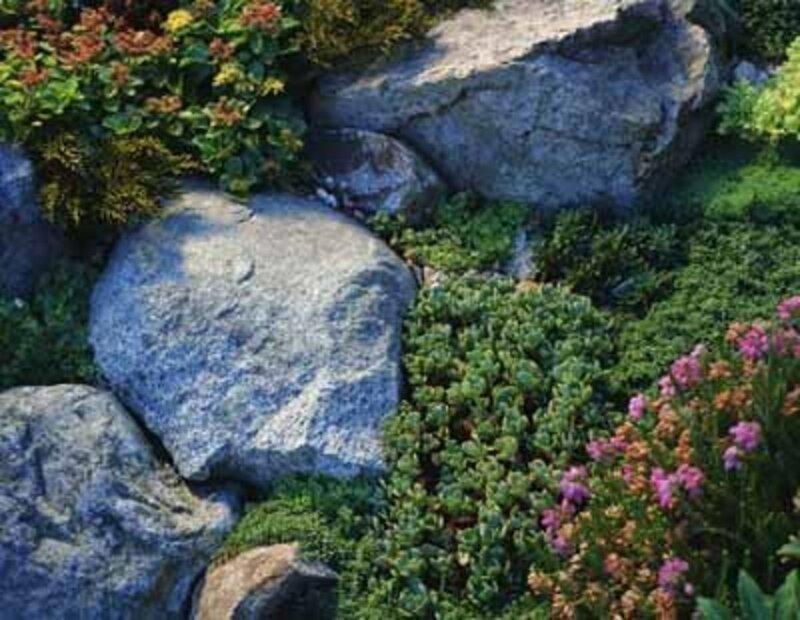 One of the perennial ground covers below could be the perfect solution to your problem. 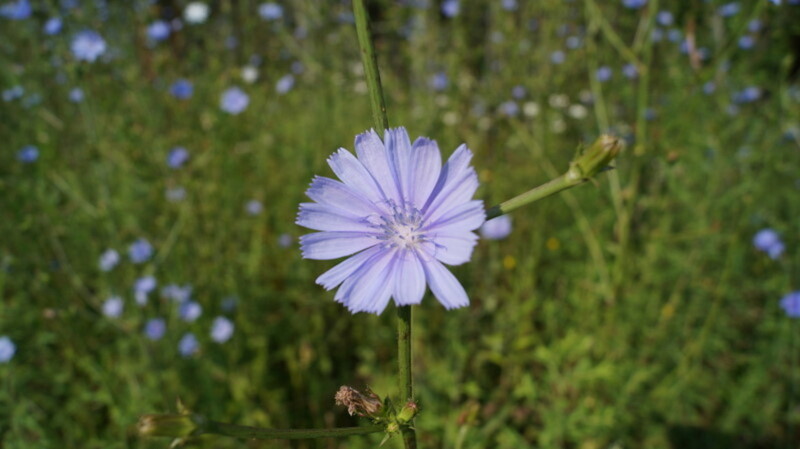 Each grows thickly, choking out weeds as it spreads. And each requires little care to thrive where few other plants will grow. See full descriptions and photos for each below. 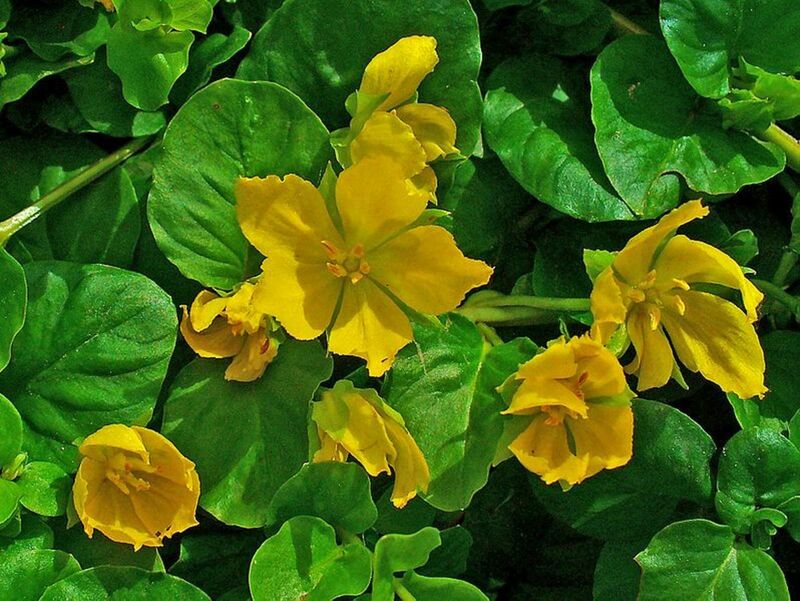 Golden creeping Jenny (Lysimachia nummularia) is a rugged ground cover hardy in zones 3-9. * It thrives in wet areas. 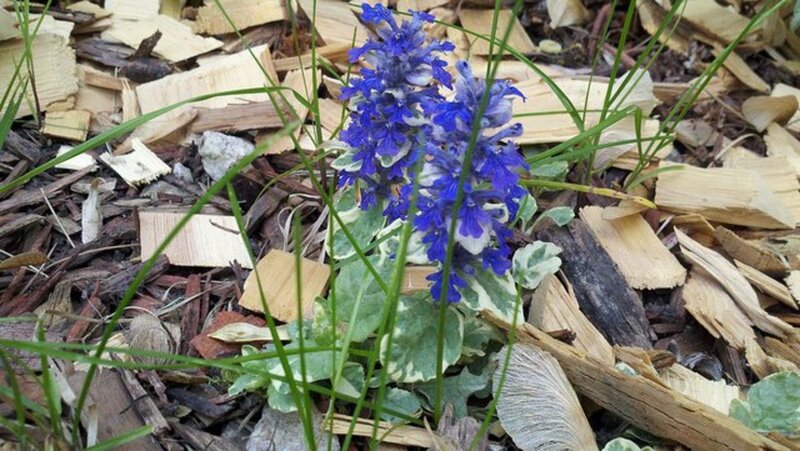 Although it grows in partial shade, for best color, grow it in full sun. Its long, trailing stems have round chartreuse leaves and yellow flowers. Creeping Jenny covers large areas quickly, putting out roots all along its stems and choking out weeds. Use it to ring a pond, trail along a wall, or edge a walkway. It even makes a great spiller in mixed container gardens. Although creeping Jenny can be an aggressive grower, the cultivar "Aurea" is relatively well-behaved. 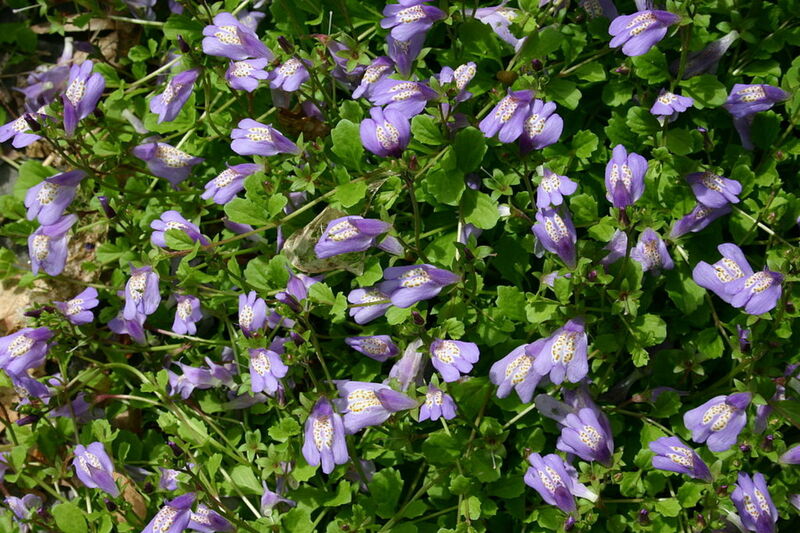 Mazus reptans, commonly called mazus, is another low-maintenance perennial ground cover. Suitable for Zones 4-9, it performs best in part shade, but it will grow in full shade, too. When the weather's hot, keep mazus moist. In mild climates, it remains green year round and begins blooming in early spring. If conditions are right, it will bloom throughout summer, sometimes even into fall. At just two inches tall, mazus is the perfect ground cover to plant between stepping stones and along walls. And it's easy to propagate; transplant small plugs from established plants in early spring or fall when they're not in bloom, or root cuttings during the summer and plant them in autumn. Creeping phlox is a classic perennial ground cover that's hardy in Zones 3-9. 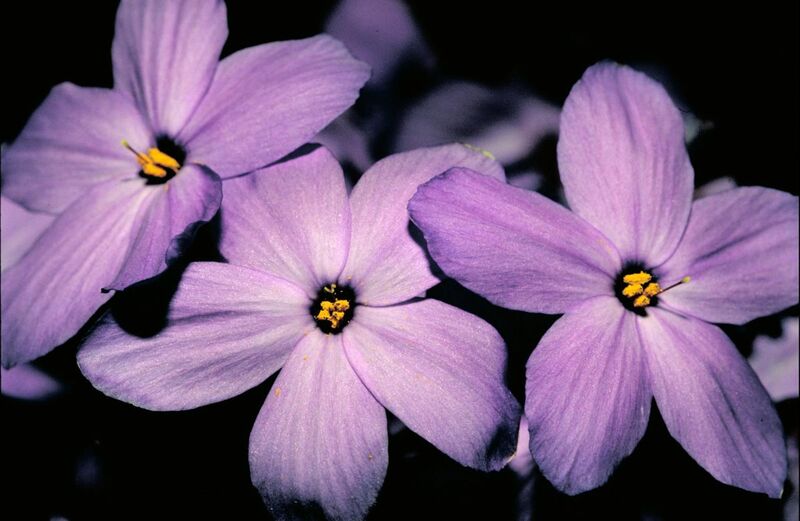 Although it looks delicate, phlox is extremely rugged, and it grows easily in shaded and full-sun areas. For shady, moist spots, try Phlox stolonifera for weed suppression. In full-sun, dry areas, Phlox subulata forms a thick, pretty carpet that keeps weeds at bay. 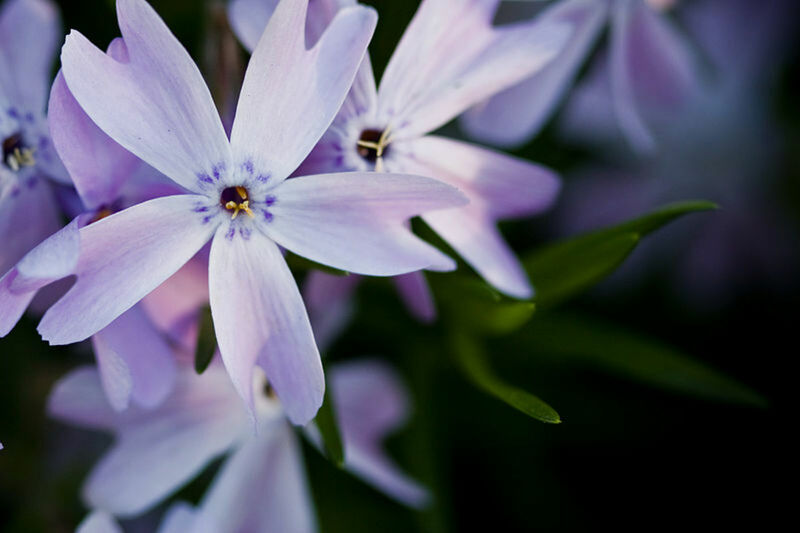 Read more about these two kinds of phlox below. Tufted creeping phlox (Phlox stolonifera) is a North American native that prefers partial sun or shade and moist soil. It has needle-like evergreen leaves that form a dense mat to effectively suppress weeds. In early spring, it produces small white or pink flowers. The 'home fires' variety is a fragrant cultivar with hot pink blooms. When flowering, it can reach up to 12 inches high. For erosion control, few ground covers work better than creeping phlox (Phlox subulata). 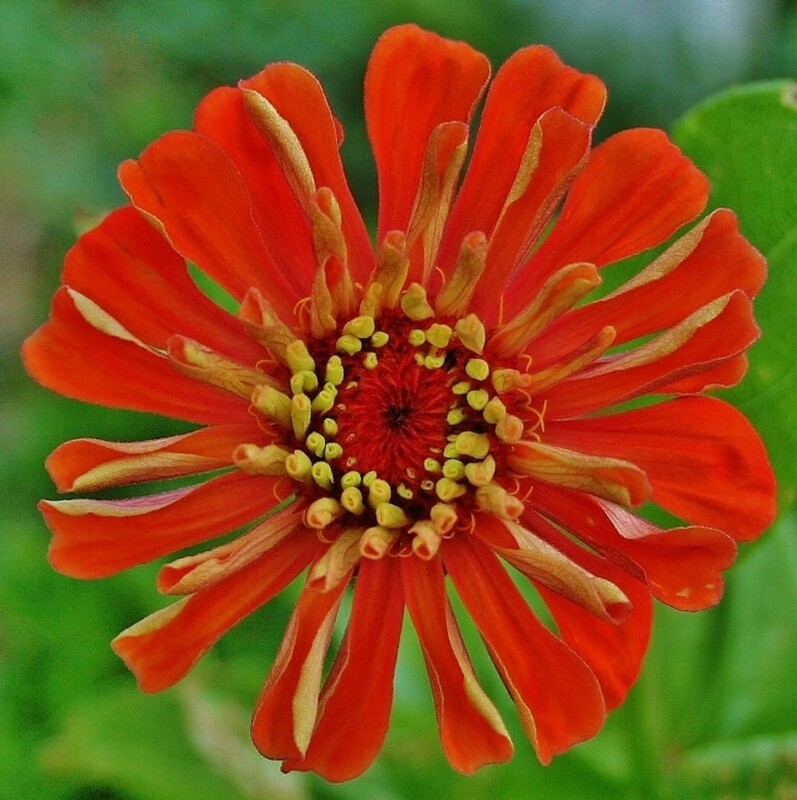 It loves full sun, it's drought-tolerant, and it isn't picky about soil quality. 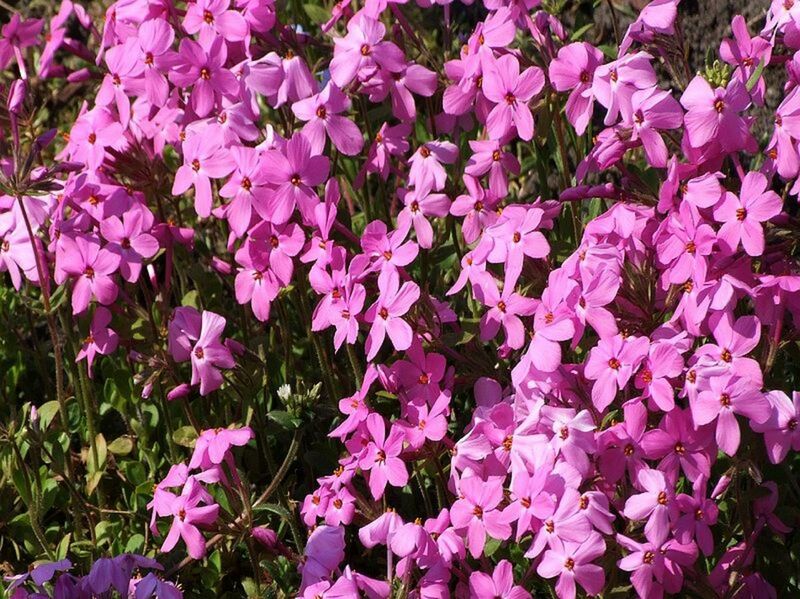 Phlox subulata cultivars come in a variety of flower colors, including white, blue, red, and pink. Like tufted creeping phlox, Phlox subulata has needle-like evergreen leaves. Red creeping thyme (Thymus serpyllum coccineus ) is a heat-tolerant, drought-tolerant ground cover that grows in zones 3 to 9. It likes full sun and grows close to the ground at only two to four-inches tall. It's deer-resistant, too. Plant it around stepping stones; it gives off a delightful scent when stepped on. Or plant it by walls, along borders, and in other areas that are difficult to weed. 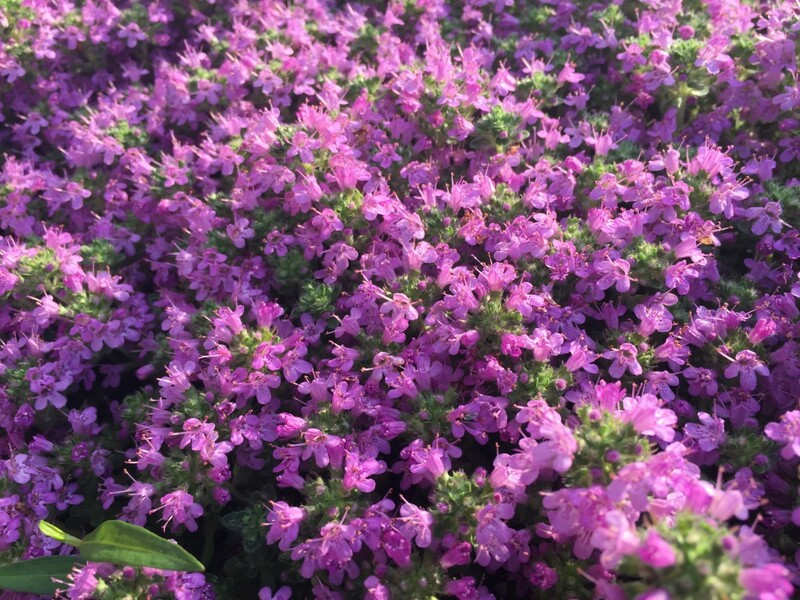 Red creeping thyme adds attractive, deep green color to your landscape throughout spring, but it's most beautiful in summer when it erupts in gorgeous crimson flowers. It really, really chokes out the weeds, forming a thick mat. We grew our thyme from seed, but you can also purchase organic plug trays for quicker results. Dragon's blood sedum may be the hardiest and most versatile of all weed-suppressing ground covers. A cultivar of the succulent Sedum spurium, dragon's blood ('Schorbuser Blut') is hardy in Zones 3-8. Not only does it grow in full sun as well as partial shade, but it also thrives in poor soil. Like creeping Jenny, dragon's blood sedum has trailing stems that root easily, so it's a snap to propagate. 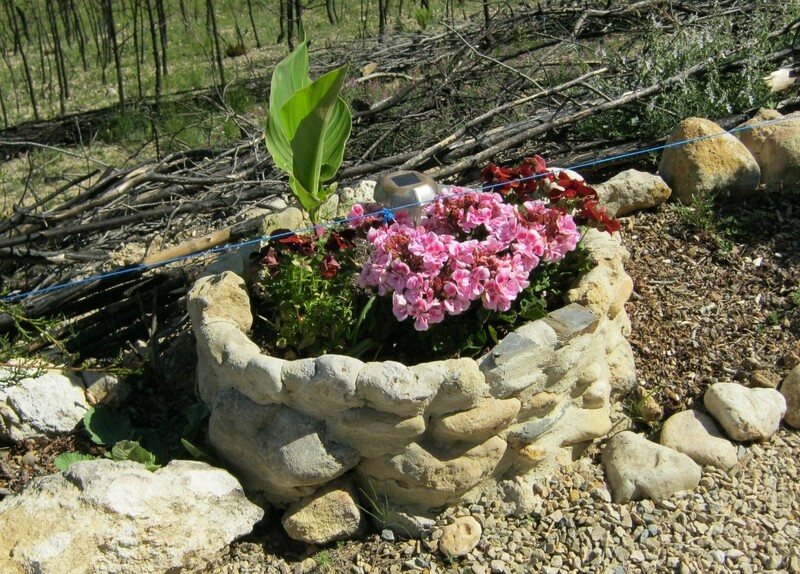 It does well in containers, rock gardens, and places where little else (besides weeds) will grow. Dragon's blood sedum looks good year-round. In spring, it produces bright green leaves that turn maroon as temperatures drop. In summer, it has showy red flowers. Less hardy Sedum spurium cultivars include ‘red carpet,' which has red leaves, and ‘voodoo,' which has mahogany-colored leaves. 'John Creech,' is a smaller, slower growing cultivar that produces pretty pink blossoms in fall. 'Tricolor' has green, pink, and white variegated leaves. No matter which variety you grow, pollinators will be drawn to its broad flower heads. Can I replace my lawn with a low-maintenance ground cover? Depending on your soil and situation, any of these ground covers could be used to replace a lawn. Any of these plants would require less maintenance than a lawn would, especially the ones that don't need a lot of water. Which ground covers don't need mowing? None of the plants mentioned above needs mowing. Which ground covers are low-growing and hug the ground? The tallest mentioned here is Phlox stolonifera, which is 12" at its tallest. Which weed-suppressors are best for shade? Mazus works best in shade, but some cultivars of creeping phlox will also work. Which are the best flowering weed suppressors? Every type mentioned here is flowering, although mazus and phlox have the showiest blooms. Although the others flower, they don't produce stand-out blooms. 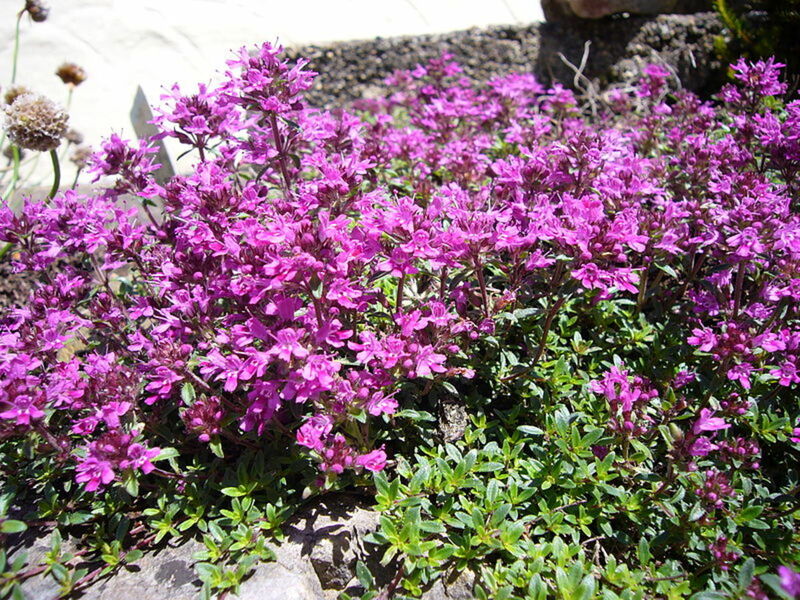 Golden creeping Jenny has yellow flowers, mazus and creeping phlox have lavender flowers, phlox stolonifera's are white or pink, phlox subulata's are white, blue, red, or pink, and both creeping thyme and dragon's blood are red. Which is the fastest-growing ground cover? Creeping Jenny is a fast grower, and thyme will gain about half its size by the next year, but really how fast any plant spreads depends upon how well it likes the conditions. They are not invasives. Which Hardiness Zone Do You Live In? If you don't know your area's plant hardiness zone, go to EdibleLandscapeDesign.com for links to zone maps in Australia, Canada, China, Europe, New Zealand, North America, South America, and the U.S. I am in Zone 10 (Southern California). I have very sloppy, sunny hillside with many weeds. I love all your flowering ground cover mentioned above, but they are all in the Zone 4-9. Can you advise any drought tolerant flowering ground cover for my yard, please? Some ice plants are hardy in Zones 9-11. Sometimes in arid climates, you’ll see them planted along highways. They have lovely flowers and are drought tolerant. Which low-maintenance groundcover can stand full sun AND be planted in a bed with perennials such as daylilies, iris, black-eyed Susan, and such? Any of these will grow in full sun; however, creeping Jenny, mazus and Phlox Stolonifera prefer moist conditions. I think creeping thyme and/or creeping phlox would work well in the sort of mixed bed you're describing. They would require maintenance, but not more than day lilies, iris, and black-eyed Susan, which have to be cut back and divided. You may have to divide the ground cover, too, and if you don't like the little flower stems that stick up after blooming, you'd have to trim them off. Will any of these ground covers compete/choke a ninety-year-old red oak tree? I have had a berm with mulch for many years, but buckthorn & weeds continuously overtake it. Landscapers always want to use PREEN and Roundup--I won't let them jeopardize the oak, but I was wondering if ground cover will take too many nutrients and water? I completely agree with you about the Roundup, etc. I doubt any groundcover would harm your oak unless it is already on its last legs, but why don't you use landscaping fabric or heavy cardboard over the weeds and mulch underneath the oak to the drip line? The dripline is the area below the outer circumference of the tree branches. Water drips from it sort of like it does from an umbrella. The drip line area is also called the Critical Root Zone (CRZ) or Root Protection Zone (RPZ). Are these ground covers all okay to step on and soft enough for bare feet? You can walk on the thyme, but you could cause plant damage if you step on the others. None of them have thorns, so they shouldn't hurt your bare feet. What do I do to keep a gardenia living and blooming? Can you mix different ground covers together? Can I combine Jenny with Phlox to replace areas where grass will not grow well for a mix of plants? That would be lovely. Just be sure to choose the type of phlox that prefers moist soil. Also, expect one of the plants to dominate, as one will probably love the light and soil conditions better than the other. What zone is northern Mississippi? Will low-maintenance ground covers choke out other flowers if planted in a flower bed? Creeping Jenny might be a problem if it likes the area and you don't buy a cultivar that's slow growing. The others, however, not so much, especially thyme, which is slow growing. What service each of these plants does perform, however, is that where they do grow, they grow tightly, making it less likely you'll have to weed. In eight years I've only had to weed my thyme patch once to root out a single dandelion. Have you considered putting down cardboard or plastic for a few weeks? That should kill the weeds, allowing you to take up a layer of roots and seeds. Then apply a barrier like cardboard or landscaping fabric and top with mulch. Good luck! I have a pollinator garden in Florida. I killed my St. Augustine grass several years ago and last year planted frog fruit. It's large variety. It looked nice at first but now weeds have taken over and the yard looks awful. If i keep it mowed, the frog fruit doesn't bloom and looks awful. If i don't mow, the frog fruit looks great but weeds take over. Not sure what to do. Thinking of trying to kill everything and start over. I live in Alpharetta, GA and I’m looking for plant to go on a berm with full sun. I want to plant it and forget about it! I will be planting Green Giants on top of the berm for a privacy screen. Ooh, Ruth, that's a type I've never grown. It sounds lovely. Great information here. I have some Elfin Thyme that I love. It is so low growing, grows in the sunniest locations, survives drought, and although it grows pretty slowly...at least I don't have to worry about it invading my adjacent grassy areas. I'm sorry you're having problems, Vlad. Without seeing the area, I'm not sure what to say except perhaps two things. The problem might be compaction. Is the ground extremely hard? If so, you may have to add organic matter to ameliorate the problem somewhat when installing new plants. Also, are you watering the new plants each morning? Although they're relatively care-free once they're established, they need daily watering until they are established. I have read again and again about creating thyme fast groth but I have no success with it I have a big front lawn that I want to convert to no grass lawn. I tried planting. Several 6 inch pots of red carpet thyme in the corner and couple of 6 inch pots of phlox as well. Most of the thyme is dead. I got one to take but it barely covers the 10 inch spot. The phlox is a live but not spreading at all. How fast are we talking about? Enjoyed this post on ground covers. I am amazed at how hardy and successful creeping Jenny has been but am planning to incorporate creeping thyme for its change up in color and weed fighting abilities. Was wondering if I could get your thoughts? I live in zone 6 (Northern Idaho). I have a north facing slope that curves around to the east. In the summer the slope is covered in weeds. A lot of mullein and lambs ear which I don’t mind but then there are huge thistles that are just scary. I noticed creeping Jenny is listed on my local native plant society. We live very rural and the slope leads into a grassy gulley on the north and woodland on the east. I don’t want to mess with either of those natural habitats. So my question, is there anything could I plant that wouldn’t choke out the natural beauty but still cover the slope and choke out the weeds? Also, given the enormity of my thistles would I need to dig them up prior to planting a ground cover? Hi Jill love your article as we are removing most of our backyard lawn in favor of drought tolerant ground cover ( don't know what kind yet, may be 2 or 3 in waves ). You mentioned in one of your comments that roses need ventilation. We have a bed with Bottle Brush and a white rose with Lipia Nordiflora ground cover. Will this bother the rose? This article was so helpful! Thank you for the information. Red creeping thyme will grow out of the bed, but . . . I like that! It's rather sweet to see it growing between the cracks of a stone border or draping out of the bed onto the sidewalk. That sort of the thing, however, probably won't happen quickly unless you set your seeds there, so . . . you wouldn't be trimming it back all the time. Hope it works for you! It's a lovely plant and very compact. I'm looking for something that would completely take over a bed, and so far the creeping thyme sounds like a great match. Does this do well in a smaller bed? 10x3' is about the size of it, and is surrounded by concrete. I just don't want to create a battle where I have to trim it back all the time. Hi Jill Such helpful information...I am looking for ground cover and it looks like I came the right spot. I am so happy to have found this. Thank you for the great information. We have a yard we are starting from scratch and have a ton of weeds that have spread from the open field behind our house. I am excited to try all of these next spring. Thank you so much Jill, I truly appreciate it! Hi Diane! Sweet fern and bearberry are possibilities if it's dry shade. Also, epimedium. Good luck to you! Hi. I live in Zone 9a, Marion county Fl. I have about 150 sq. Ft. area that I need to cover. It is North side of home, sees no direct sun. I need weed control, and hopefully something about 8-inches tall or so. I do not care it it is flowering or not. Low maintenance, sandy soil. Thank you so much! Mazus would be a good choice for you, Ginger. Good luck! I have a spot with limited sun and in need of ground cover so the dirt will not wash away on a slight slop on the East side of my yard. . I have an area in front of my deck that will occasionally hold water if we have a lot of rain. Could you recommend a colorful ground covering that would be tolerant of that. I live in zone 7. Thank you. I have a pond with a small island in my backyard. I'm looking for ground cover for the island so I don't have to wade through the pond to maintain grass or other plants. I'd like something that is only a few inches tall and flowers would be a definite bonus. I live is southern Pennsylvania. Paddy M, lots of herbs are distasteful to rabbits, including thyme and Greek oregano, both of which I use as a groundcover. You'll have to harvest the oregano to keep it looking good and low to the ground, but it's super hardy. Best to you! We are looking for a vigorous ground cover to overcome grass that has taken over in our perennial beds. I know grass has a thick root system that makes it hard for our desirable plants to get water and nutrients. Do any of these ground covers have super-thick root systems like grass? Reading your comment makes me excited about your projects too! I love creeping thyme and have some near a rose bush. Over the last couple of years it has moved itself away from the bush toward the rocky edging. Plants have a way of doing that! I find that ice plants "travel" on me too. Since roses need good ventilation, I didn't mind too much and planted clumps of chives a good foot or so away as companion plants and, off the to side, the herb feverfew, which repels pests of all sorts. The thyme really can stand up to foot traffic. I also find that if I plant among it, the disturbed area looks good within a day or two. You shouldn't need to water it after it's established. I've had success with sedum rupestre 'Angelina' in the same area. At first I didn't like it because nutbsedge kept growing through it, but as it's become more established, it's suppressed the nutsedge and is now a lovely green/gold carpet that keeps its color in winter, turning a bit red when it's really cold. I think using sedums on the slope is a great idea, but you probably will need to weed a little bit until they get established. I think that's true with any groundcover unless it's an invasive plant, and then you'd have another sort of weeding to do! I'm glad the article was helpful and wish you much success as you experiment. GREAT article! I have been trying to choose some groundcovers for 3 areas - and I have been studying the ones you listed. I live in NC, Zone 7b. One area is by my hedge roses - in the flower bed between them and the next row. I had to leave at least 12" to walk through to prune and treat roses. I was thinking creeping thyme or mavus bc sunny, and will get water some when I water the roses - or I CAN water it. Also, of big importance is that it is possible to walk on creeping thyme. Do any of the others have that quality? Second, I need something over and around my oriental lilies. I understand they will grow up through mazus... But maybe not through the others?? Third, I just need something between new plants in a new flower Bed I am opening. It was going to be on top of a slope, but now I think it will be on the actual slope - so that people will see it. I am using drought tolerant plants, and I do NOT want to have to weed every week OR drag in tons of mulch every year. So, I think a combo of ice plants (6 total max), stonecrop (I have 6 total i can use and 2 of those are Fuldaglut - which you've mentioned), and creeping thyme, or mazus. I hope i won't be doing much watering after the first year. I am up tonight ordering the last few plants for this project (#3 above) because a good clearance is ending! If it helps you help me, I am trying to focus on various shades of pink and purple at this location. Maybe white groundcover? Purple mixed with lavender butterfly bushes, pink cotton candy muhly grass, pink armeria, probably Lord Lieutenant Windflowers (blue-ish purple), French Lingerie reblooming daylilies, maybe a Millenium Globeflower, maybe Lilac Sensation OR Josee Lilac. I will add a bright crape myrtle in the fall - UNLESS you have a suggestion for a long or multi-season interest tree. Potentially a gardens because I may have a spare later. I'm struggling re choosing tall plants/trees. I have a Limelight Hydrangea tree nearby, but it hasn't grown much in two years. Soul is compacted, and it is a hot location. (Major drought last year - ceaseless rain now). Sorry to go on so much... I'm actually planning this tonight and I'm excited. I don't know if a wider person would add more plants for their foliage... Thanks so much with help re groundcovers! BEST article I have found! Definitely! Karen, that depends on many factors, including what the area is like, what you're sowing and when you're sowing it. You may want to ask your local extension agent. Can I just broadcast seed the area? I have a large sectioned area that I planted 2 types of sedum in several years ago. The soil is more on the sandy side. My problem is that it seems to be cultivating more weeds because the sedum doesn't seem to grow really thick. Any ideas on how to get the sedum to thicken up in order to choke out the weeds? I live in zone 5. I'm sending you a link to the CA native plant society website. (I belong to the MD native plant society.) http://www.cnps.org/cnps/grownative/tips/lawn_alte... The site which has recommendations for native plants you might like to use to naturalize that shady area of your property. You might like Mimulus aurantiacus (bush monkey flower). It tolerates shade and has a cheerful yellow bloom. Best to you! My house in Lake Arrowhead, CA is taken over by weeds. Very shady, drought can be an issue in CA. Oak Trees block the sun. House is at 5,500 elevation, 18 miles south of Big Bear. What covering should I use? My wife does not want weed killing chemical spraying. Help! thanks. I'm so very glad to has discovered this site. I live in Tampa Florida..in the City..but still a neighborhood that enjoys a quarterly "Best Yard" notice! My home faces the North and I have plenty of weeds...I keep them mowed to save face...but weeding the entire yard wood leave me with sand. What would you recommend or suggest to help me possibly get thru this heart ache? Except re-sodding, and if I have to do that..I might just cement it! Disparately seeking help! Hi, we just bought a new house and there is no landscaping at all, just dirt and weeds starting to grow. I am going to plant some Spring bulbs and some trees and bushes now during Fall here in Northern Utah. And then I want to plant a ground covering to choke out the weeds in the landscaped areas. Is it best to plant the ground covering in Fall or wait til Spring? Also, my main concern, is will the ground covering choke out the bulbs from coming up year after year? And will the ground covering jump the curbing and start growing in the grassy areas? I want to avoid landscape fabric because it doesn't work well from my experience. Thanks so much! Hi, enjoyed the article !! i have a 200sqm area that was a lawn area before i travel.. It has become a weed area, i am planning to design it next year..however i need to clean it and grow land cover in the mean time. What would be a fast growing , yet easy to pull out ground cover in south Australia , full sun , preferably less watering during summer. I hope it can rejuvenate the soil .. I will appreciate feedback on possible options. Many thanks. I live near Republic, MO and we have a lot of weeds and the front of my house has big bushes I want to pull out, because they just collect a lot of leaves from our 30 trees we have on our 5 acres. I have young baby, so don't want high maintenance, and currently have a lot of wasps living in the front bushes as well... Is there something you would recommend to plant here? It is partial shade or mostly shaded area. Hi "Leafy Splurge." There's a new dragon's blood sedum called Sedum spurium "Fulda Glow" (Fuldaglut ) you might want to try in your Zone 3 garden. I have no practical experience with it, but it's supposed to be hardier than the other varieties and stay somewhat green even in subzero temps. Good luck! Do you feel either the dragon's blood sedum or the Red Thyme wood work in fighting Leafy Spurge in sandy / dry soils (Saskatchewan near Saskatoon, Canada)? We are looking for ways to cut down or get rid of chemicals while getting control of this weed. I was needing something like this. My kids keep insisting on weeding the places that have no plants in them. This is much easier for them, but makes overall maintenance harder for me. SOMETHING has to fill in the dirt before the weeds come back. O, Jill, these are lovely enough to used solely for the beauty they impart. But knowing that they serve the purpose of helping them to control weeds makes them all the more appealing. Thanks for sharing. This is being bookmarked for later reference. Thanks, rbm! Hope the phlox works for you. Thanks for stopping by. Good information! I really like the creeping phlox, will give this a try in my front yard. Good hub! Great choices! Especially the thyme. I use herbs mulching around them for these situations because they are so useful. Thanks for a great hub. Thanks for reading, fdoleac. Hope you give dragon's blood a try. It really is a remarkable plant! Thank you for this information. Of particular interest is the dragon's blood sedum. Sounds like we have some of the same issues! I'm in Zone 8. Soil compaction will probably be your greatest challenge. Red creeping thyme would work where you are, and so would ice, although it allows a few weeds to peek through, but it spreads like a dream. On banks, try Scarlet Flame Carpet Phlox or moonbeam coreopsis (drought tolerant and it has a sweet flower). If you want even more color, you could use daylilies, too. Exploded pumpkin daylilies won't choke out all the weeds like a thick groundcover, but deer don't seem to like that particular cultivar, and they bloom more than once. They're easy to naturalize, so they'll spread on their own. Rudbeckia fulgida 'Goldsturm' (a hardy variety of black-eyed Susan) spreads like a weed here. It blooms a long time and looks interesting in the winter, too, if you don't cut back the flowers. Wow! I'm talking way too much! Wish you luck! Thanks to your Backyard Gardener link, I determined that I'm in a zone 9 region. Dry and dusty hard packed clay soil on a dirt road (lovely!) that is excellent at breeding waves of weeds. I need to put 'em down once and for all with some tenacious ground cover. I'd like to do so with some variety since there's a lot of (ha!) ground to cover. Thanks for the positive feedback, Miss Mellie. I really appreciate the encouragement! Tell me your general geographical location, and I'll try to come up with some drought-tolerant groundcovers for you. Voted up and useful: I've been looking for some weed-choking ground cover, and here you supply the very ideas I need! Now: any additional suggestions besides Dragon's Blood for poor soil in dry, sunny spots? I have slope areas to cover, and would love to see more options, particularly plants that get along with minimal to no care aside from watering. That's great! Hope it works out. thanks, we were just talking about a problem area in our yard and you may have solved the problem. Thanks, Eiddwen. Btw, I really liked your Barley Saturday hub (https://hubpages.com/hub/Join-me-on-Barley-Saturda... The pictures were great! A very useful hub and well presented. What a great choice! I like burgandy colors in the garden, too. Thanks for stopping by! Thanks so much for these ideas. I'm definitely going to try the dragon's blood sedum. Great hub!